Attractive, realistic-looking Visio equipment shapes don’t have to be heavy and inefficient. In this article, we’ll look at some innovative A/V equipment shapes from D-Tools that offer the win-win scenario of good-looking and light weight. We’ll tear these SmartShapes apart and show how you can use custom line patterns and creative shadow techniques to add pizzazz to your shapes, without adding bloat! Beauty and Intelligence: Mutually Exclusive? Ah yes, the ShapeSheet giveth, and the ShapeSheet taketh away. Visio SmartShapes offer a wonderful vehicle for delivering powerful graphical objects with built-in intelligence without code. But the complexity of the ShapeSheet also adds bloat to even the simplest of shapes. But if we dip deep enough into our cauldron of Visio Black Magic, we can often find choice morsels to help us fight back! And in today’s case, we get some really cool effects without using the ShapeSheet at all, so just about anybody can take advantage of these techniques! Well, those are some mighty attractive speaker shapes! Not bad for a “flowcharting app, business graphics” application, eh? 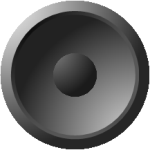 When I first saw these shapes, my “expert eye” told me that the woofer and tweeter were both composed of at least four circles, each with fancy gradient fills. Although eight is not a huge number, that many separate shapes could start to get unwieldy if you have to protect and guard formatting or enter smart formulas to control sizing. I also suspected that the cool shading effects might require my complicated, yet attractive Off-center Radial Fill Effect technique. Well it turns out that I was wrong. 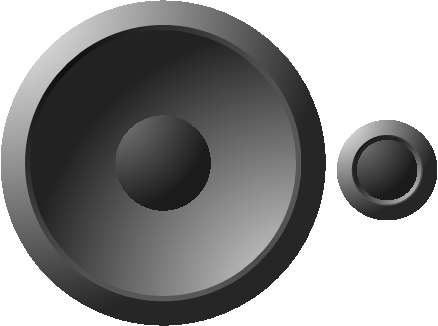 A graphic artist (aka: young whippersnapper) at D-Tools is clearly smarter than I (although I can probably still out-do him in calculus…) He was able to create the woofer and tweeter much more simply, using just two circles for each unit! Both of these techniques are readily available to end-users. 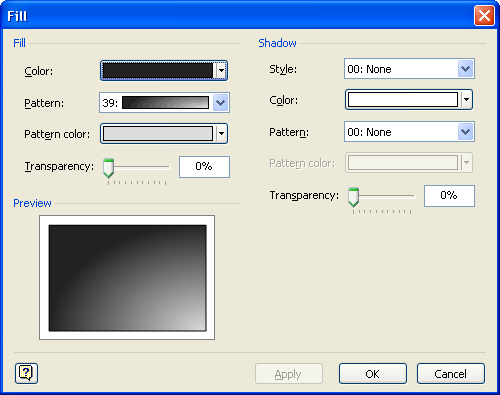 Custom patterns are a bit more hidden than shadowing, but neither feature requires ShapeSheet development or programming to achieve. I’ve talked before about using shadows to squeeze more formatting and color into a single shape in this article: How Many Fill Colors Can You Put on a Visio Shape? So let’s move along and show how these two techniques were used to create those nifty-looking speakers! Our friend at D-Tools created the “Bevel2” pattern, by creating a simple rectangle, filled with pattern #31. Pattern 31 creates a fill that gradates from the top-left corner to the lower-right. 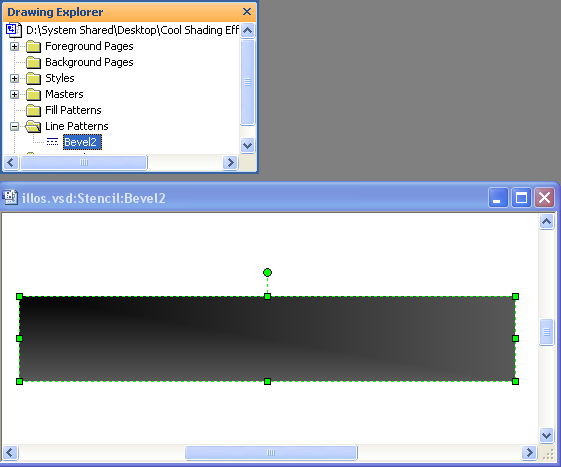 Once the line pattern is created, you can apply it to any shape using the Format > Line dialog. In our speaker shapes, Bevel2 is used as the second-outermost ring on the speakers, not the outermost ring. If you look closely at the speakers at the beginning of this article, you’ll see Bevel2 just inside the really big, outer bevels. You can imagine these patterns being used in a variety of ways to create some really good-looking buttons, knobs, bezels, frames, switches and other gadgetry that make up A/V equipment! 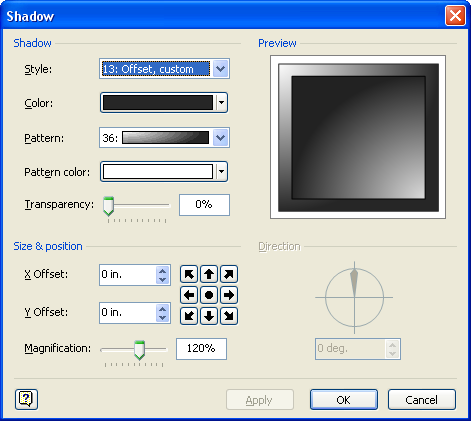 Starting with Visio 2003, the shadow characteristics of Visio shapes were really opened up and made more flexible. Shadows can now have different sizes, shapes, and projections. In the right hands, these shadow options can be cleverly manipulated to create effects that look nothing at all like shadows. 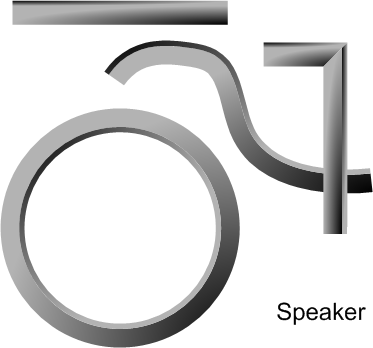 One such technique was used to create the outermost edge of our example speaker shapes. So this shadow has zero offset, which means it sits directly below the shape. But it has a 120% magnification, which means it is bigger than the shape itself. And this extra size projects equally in all directions because of the (0, 0) offset. Therefore, we end up with the outer-bevel effect that we see in the speakers! The first time I saw this, I smacked myself repeatedly, uttering the words; “Why didn’t I think of this” over and over and over. The centers of each speaker shape use some form of corner-radius gradient fill to get that bulbous, protruding effect. This can be achieved using fill patterns 36, 37, 38 or 39 . 2. 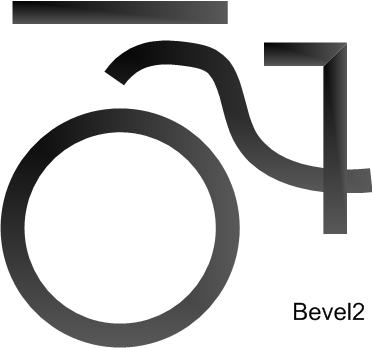 Apply our custom line-pattern “Bevel2” to the circle. 3. Apply fill pattern #39 to the circle to create a 3D effect for the speaker cone. 4. Apply the magnified shadow effect. 120% magnification with zero-offset. This forms the outer edge of the speaker. 5. Add the center circle. This is simply a smaller circle shape, with fill pattern #36 applied. I hope you enjoyed reading about these techniques, and I hope you put them to use in creating your own SmartShapes. Let us know what wonders you come up with, we’d love to share! Thanks for the props. It is always nice to have your work recognized by an expert. I think a lot of our users just take this kind of functionality for granted. Your readers may also want to know about the Line Weight formula in the speaker shape, LineWeight:=Height*0.02*User.AntiScale. This allows the bevel size to re-size intelligently with the height of the master shape so this one shape will look “right” no matter what the size. Lets see the Photoshop/Illustrator geeks top that! Thanks for pointing that out, Adam! My articles tend to get too long, so I’ve been trying to cut out details. Your comment reminds me that this web site could use a few articles about sizing and scaled drawings. Speaker Stencil no longer exists. The info metal mentions should be moved to the top of the article. 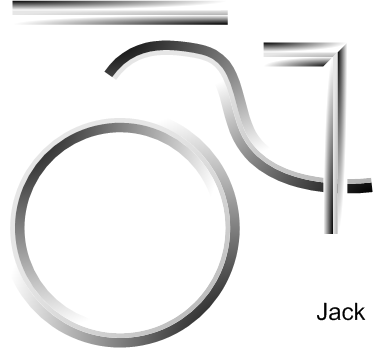 “Speaker Stencil no longer exists”, you mean in the latest D-Tools release of SI? I think the technique in this article might also have issues in Visio 2013. I don’t have time to research it right now, but maybe someone can chime in if they know for sure. I need some help in understanding how to copy a let us say a milestone shape from the timeline stencil and have this shape when moved to the swim-lane to drop at a particular vertices related to the timeline and based on external data from an excel workbook. I am a bit confuse about how to set the values in the shapesheet to make the milestone take the value from a column of excel external link data and display the project activity and ensure the color to change to green when the activity is completed. A documentation could not be found on the net so far unless you may direct me to one. There is no syntax to directly link from the ShapeSheet behind a Visio shape to an Excel workbook. While they look similar, they are separate systems. You can link Shape Data fields in shapes to external data sources using the old DataBase Wizard, or using the newer data linking capabilities that appeared in Visio 2007 Professional, and continue in Visio 2010 Pro/Premium and Visio 2013 Pro.